I grew up with a grandpa who spent the majority of his Saturday afternoons shining his shoes. It wasn't just therapeutic for him, he also believed that you can tell a lot about a man by looking at the shoes he wears. I grew up predominantly in the 90s where grunge, beat-up Doc Martens and Chuck Taylors were the norm so you could just imagine his disapproving face whenever suitors would drop by our house in their nasty shoes. He couldn't help but judge. I used to think he was overreacting but now that I'm older, I totally understand where he was coming from. I have nothing against Docs and Chucks...I love them. But if you aren't a rockstar, you're above 30 and you're at a formal function or meeting, those shoes have no business being there. You simply won't be taken seriously or maybe even let in the door. Forget about closing the deal or getting that promotion. Anyway, now you know where my shoe fetish comes from. Back to the topic at hand...investing in a good pair. A good pair doesn't only mean quality leather, it also means excellent craftsmanship and comfort...something Santoni has been specializing in for years and now it's finally in the Philippines. 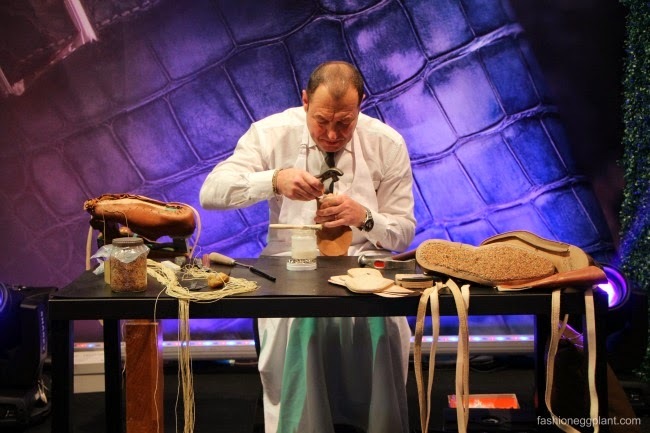 To celebrate the opening of their first ever store, the Lucerne group and Santoni flew in Italian master artisan, Francesco De Santis to showcase the art of shoemaking for the ultimate "Santoni Experience" - which is to always be of service to their client and their wishes. Each bespoke shoe is meticulously measured and their clients get to choose everything...from the shape, the hides used...every little detail. It takes over 200 steps and 60 days to finish a single shoe. The result is a one-of-a-kind perfect pair. For Santoni's Spring/Summer 2014 Collection, inspiration was brought about by the gestures of the new contemporary man. Old materials and models were reinvented and personalized in a wide variety of colors, patinas and styles. The women on the other hand, are treated to a set that depicts a flawless combination of the urban and the natural. Santoni collections are available in selected boutiques worldwide and in flagship stores in Milan, Rome, Cagliari, Lugano, Cannes, Baku, Beijing, Doha, Dong Guan, Guangzhou, Moscow, Shanghai, ShenYang, Singapore, St. Moritz, Tokyo and now also at the 2nd level East Wing of Shangrila Plaza Manila.